Since 1990, John K. Carter has provided representation for individuals in Oldham, Henry, Tremble and Jefferson counties in matters of estate planning, domestic relations and personal injury. 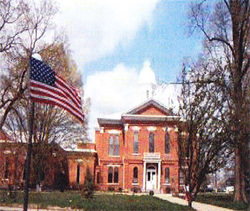 I opened my law firm in La Grange, Kentucky after serving as a Judge in the Jefferson District Court. In January, 2011, I was elected an Oldham County Attorney. I bring a strong sense of justice and professional demeanor to my practice and work intensively to help secure your legacy or resolve your domestic or civil dispute. For more than 22 years, I have helped individuals strategize for the future of their families and have successfully delivered favorable resolutions to a wide range of family law matters and cases involving victims of negligence. I use my extensive knowledge and experience to represent you aggressively in your legal matters. A desire to help — My professional and personal satisfaction comes from being able to help people in a variety of legal matters. I deal with each client one-on-one and am attentive to the unique details of each case. Through meticulous planning and aggressive execution, I achieve positive results for you. Broad knowledge — I approach my cases with broad knowledge derived from my years of experience as a Judge. I have a strong understanding of a wide variety of legal issues. Extensive experience — My knowledge has been fine-tuned by more than 22 years of experience representing clients in the courtroom. As a trial and appellate lawyer, I have a professional courtroom demeanor and I aggressively and effectively advocate on my clients’ behalf. Estate planning — In estate planning, I help you secure the long-term well-being and financial security of your family through transferring assets, minimizing taxes, choosing an executor, appointing a guardian and drafting a will. Domestic relations — I provide legal services in areas of domestic relations and family law from adoption to divorce and child support. I effectively negotiate for you in mediation or aggressively represent you in court. Personal injury — I represent clients in personal injury matters, including auto accidents, medical malpractice, unsafe products, dangerous drugs, slips and falls, unsafe work conditions, and more. Contact a knowledgeable Kentucky lawyer today. Call John K. Carter today to schedule a free consultation at 502-584-2100, or contact me online.